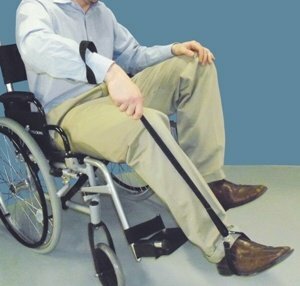 Assists people with limited lower extremity strength lift their leg and foot onto a wheelchair footrest, bed, into a car, etc. The foot loop stays open until strap is pulled and then conforms to the shape of the foot for a secure and comfortable grip. Rigid middle section allows for easy maneuverability. Made of 1″ (2.54 cm) wide, high strength, nylon webbing. 36″ (91.4 cm) long.